​Interview by Ian Gray, August 16, 2016. Darla Bodnar: Soccer Program coordinator for Bonnie Doon for past 5+ years. Resident in the community since 1994. Lives with husband Randy, and two boys, Jack (16) and Tom (13). Darla recently stepped down as coordinator, while Patti Kehoe, her co-coordinator, continues in a support role. Tom’s U8 team – I started coached together with Patti. How did you move into the Program Coordinator role? 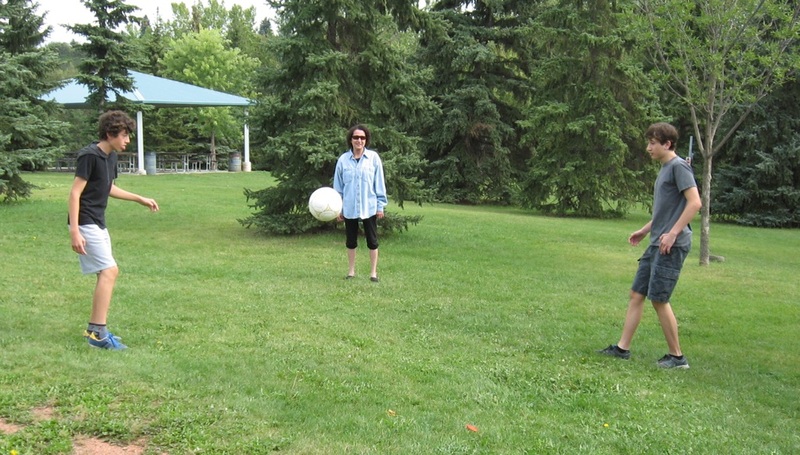 I started taking over from Sally Kosowan, who had been handling soccer but was moving. I started helping behind the scene, and then eventually Patti and I took over. We worked with the zone and have helped pull together a strong program. There is lots of information available to coaches now, practice plans are laid out, all children are receiving standardized guidance appropriate to their age level. It is so much easier now to coach. It’s straightforward now, even if you do not have much experience with the game. The real strength of the program is in our coaches. We have great coaches that are well-trained and keep coming back. Parents love it, and we have a steady request from families outside the community that want to play for Bonnie Doon. Our program has a really good reputation. Any trouble managing the workload? I was so tired! Coaching, then running the program, my boys playing U8 and U10. Running off my feet. But rewarding. I remember we had a really great U10 team with Jack. The program has doubled in participants over the past few years. What were some of the challenges running the program? Occasionally we would get mouthy parents. Don’t take it so seriously folks, it’s all for fun! That said, I must say people in Bonnie Doon are great! The community has been so supportive. So many people over the years have offered help, whatever I needed. My problem is I’m a control freak, so it was hard to ask people to help! Meeting people and getting to know the children. There are so many wonderful kids in this community. They’ll come up and say hello to me, but I don’t know who they are! I know every kid’s name in the community on paper, but not all their faces. I’ve loved watching the kids grow and develop their games, it has been amazing. Personally it’s been such a good experience for my boys, very fulfilling. For example, Tom just came back from playing a tournament in Seattle, a great experience for him and his teammates. I remember a couple times we had terrible weather during the Paul Johnston tournament. We thought we were going to die. That was frightening, but also unforgettable. Some good wrap up parties also. Don’t do it!! (laughs) just kidding. I really believe we’re the best community to live in, very family oriented and so many great people in our neighbourhood. If you have an opportunity to participate, take it! Or just step up and volunteer, it’s worth it. Soccer is a great way to meet people, hanging out on the sidelines or pulling together the program. It doesn’t get much better than this.